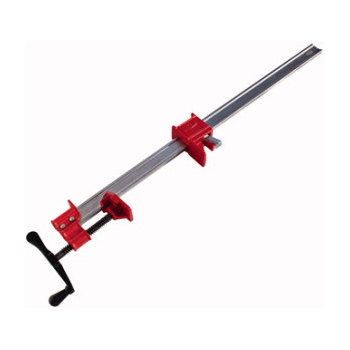 The BIGfoot clamp bar is constructed of super lightweight aluminum for easy handling. Our specially designed base is extra wide for great stability when clamping your stock. An easy to turn handle is raised to clear your work surface so you won't scrape you knuckles while rotating. 12" Clamping between clamp jaws. 24" Clamping between clamp jaws. 36" Clamping between clamp jaws. 48" Clamping between clamp jaws. Designed to meet the demanding needs of industrial workloads.The I-Beam is very stiff – will not bend or twist like other clamps over a long distance. These clamps are best for powerful clamping of small spots, where strength and straightness over a distance are crucial to hold wood in alignment. BESSEY IBeam clamps are ideal for high-demand industrial and institutional woodworking. ACME threaded screws with 9 ⁄16" spindle diameter.